Hawaii DOE: Plans to Tighten Teacher Tenure Rules. The new system is subject to union agreements, and is not expected to be fully phased in for several years. In the meantime, the DOE has offered principals and vice principals "employee termination training," with lessons that include the due-process rights of tenured teachers and the kinds of support and professional development administrators can give ineffective teachers to help them improve. Instead, said Yvonne Lau, acting administrator for the DOE performance management section, the idea is to get principals and teachers more comfortable with having difficult conversations about performance, improvement and consequences. The emphasis of the training — and the new system — is on rewarding effective teachers, helping marginal teachers improve and pushing bad teachers who aren't getting better out of the classroom, the DOE said. Read the full text and reader comments at this link. 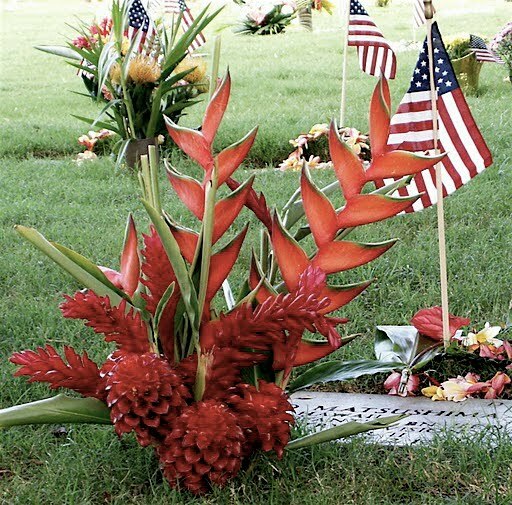 As we approach Memorial Day History Education Hawaii invites all to pause, reflect and remember those who paid the ultimate price for America's freedoms. 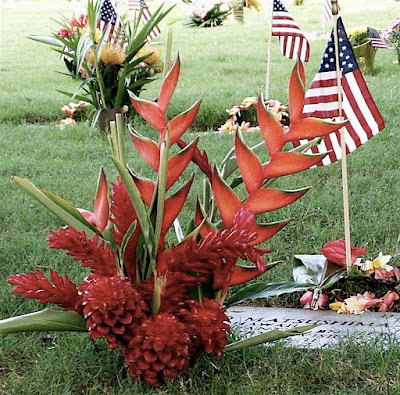 Each year the grave sites of those who perished in battle are decorated such as seen in the picture above at the National Cemetery of the Pacific (Punchbowl Cemetery) in Hawaii. Each stone represents a personal history worthy of remembrance by present and future generations all over the world. Last year we posted a link to a page furnished by the Department of Veterans Affairs, focusing on the history of this federal holiday. Click here to view it. History Education Hawaii's office will be closed until Tuesday morning, May 31. We wish all a safe, restful and reflective commemoration. The Churchill Centre in the United States seeks to reward and to publish exemplary high school history research papers with a focus on Winston Churchill or his works. Hawaii-based high school students are urged to submit papers. Authors should seek to examine an aspect of Churchill's life or works in the context of his times. Such an approach might necessarily include analysis of, for example: his colleagues, both friends and adversaries; important political questions and events, both domestic and international; diplomatic issues; economics; and his speeches and writing. Three prizes will be awarded in the amounts of $1000, $500 and $250 and winners will be announced annually on Churchill's birthday, November 30th. 2012 research papers must be submitted by September 15, 2012, which will allow ample time for revisions to promising papers submitted to teachers near the conclusion of the previous academic year (May/June 2012). (Papers are eligible for submission until September 15 following the author's graduation from secondary school.) Schools may submit no more than five papers each year. All students who submit a research paper will receive a one-year membership to The Churchill Centre, including a subscription to Finest Hour, The Journal of Winston Churchill, published quarterly. The paper must demonstrate that the student has undertaken research, collected evidence and selected information using appropriate methodology; has interpreted evidence and drawn well-supported conclusions; and has written a finished piece of work. Biographical recitations will not suffice. The Churchill Centre, since 1968, is a 501(c)(3) organization devoted to educating new generations on the leadership, statesmanship, vision and courage of Winston Spencer Churchill (1874-1965), welcomes papers from American secondary school students whose course requirements include a research paper, but also from motivated students who wish to complete such a project independently. We urge students working independently to seek a faculty or community mentor. We urge you to encourage your diligent and motivated students to accept the challenge of this opportunity. By submitting their papers, authors give permission for their work to be published online at www.winstonchurchill.org. The Churchill Centre may publish award-winning research papers for educational purposes. We seek history research papers of the caliber published by The Concord Review, the only quarterly journal in the world to publish the academic work of secondary students, and a great friend of The Churchill Centre. By prior agreement with Will Fitzhugh, Founder/Editor of The Concord Review, papers submitted to The Churchill Centre remain eligible for submission to The Concord Review. To review the style of paper we seek, see here. The Harold K.L. Castle Foundation pledged yesterday to double its giving to public schools over the next four years — with annual grants of $2.5 million to help push forward planned reforms — and urged other philanthropic organizations to also increase their support. The $10 million will go to personnel development programs, including training for 36 principals who will be charged with turning around low-performing schools and a project to ensure that every teacher has a highly trained mentor by 2013. For more, and a full-text of the story, go to this link. There are many important variables to consider in evaluating the causes for academic failure or success in the high school classroom. The training of the teacher, the quality of the curriculum, school safety, availability of books, etc., etc., are extensively studied, and all these have a part to play. But I would argue that the most important variable in student academic achievement is student academic work, including classroom work. Why do so many of our high school students do so little academic work? Because they can get away with it. A close study of the academic demands on students in the vast majority of our high school classrooms would disclose, I feel certain, that one of the principal reasons for their boredom is that they really have nothing to do but sit still and wait for the bell. In most classrooms the chances of a student being called on are slight, and of being called on twice are almost nonexistent. If a student is called on and has not done the reading or other class preparation, most probably the teacher will just call on someone else. There are no real consequences for being unprepared, and as a result many, if not most, students are unprepared, and that also contributes to their boredom. By contrast, on the football or soccer field, every player is called on in every practice and in every game. Even if a player is on the bench, there is a constant risk for most of them that they may be called on at any time, and if they do not know what to do, the disgrace and disapproval will be obvious and swift. The same may be said for Drama productions, Chorus, Model UN, and most of the students' other activities. In extracurricular activities, the student will often face a peer pressure to do well that is usually lacking in the classroom. Peers in the classroom may even think it is cool for another student to "get away with" having done no preparation for the class. It is these circumstances, among others, that lead, in my view, to the findings, by the Indiana University High School Survey of Student Engagement (2005), that of the 80,000 students they questioned, 49% do only three to four hours a week of homework, and they still report getting As and Bs. I can not think of a single high school sport that asks for only three to four hours a week of practice, and so little time would easily lead to an athletic failure to match the academic failure of so many of our students. The absence of serious academic demands on the attention and effort of students in our high school classrooms means not only boredom and daydreaming, but allows students outside of school to spend, according to the Kaiser Foundation study (2005), an average of 6.5 hours a day (44.5 hours a week) with various electronic entertainment media-not homework on the computer-but entertainment. Somehow, in addition to all that time spent entertaining themselves, high school students usually find time for an active social life, perhaps a job, and often sports or other student activities. While we have lots of research studies on test results, teaching training, per-pupil expenditure, new curricula, professional workshops, and many other subjects, I believe there is a striking need for a close study of what students are actually being asked to do while they are in class. The remarkable thing, to me, is not that 30% to 50% of our students drop out before graduating from high school, but rather how the other 50% to 70% of them stay in a situation in which so little is asked of them that they are often bored, and in which they are usually very tired of sitting and waiting for the bell. We sometimes claim that if only the teacher is brilliant or entertaining enough, boredom can be banished, or if we show enough movies, PowerPoint presentations and DVDs on "relevant" subject matter, the students will not sleep in class, either with their eyes open or closed. But imagine how absurd it would be to expect students to stay committed to a sport where they spent all their time sitting in the stands while the coach told wonderful stories, showed great movies and talked amusingly about her/his personal athletic history. The students come to play, as they should, and their motivation to participate is rewarded by their chance to participate, often with sweat, strain, and even potential injury. When we make so few demands on students in the classroom we should not wonder why so many check out, and are really "absent from class," whether they are sitting there or not. If they have nothing to do, and nothing is asked of them, and they are not challenged academically, then really they are better off if their attention and their minds are on other things that may offer them greater rewards than sitting still and doing nothing. I hope the education research community will consider comparing the academic demands on students in the typical classroom with the demands of other activities in which students take a more active part. Let us discover which high school classrooms are like law school and business school classrooms, where students are expected to be prepared and are at risk to be called on for clear proof of their readiness at a moment's notice, as they are in the games and matches in which their energy and commitment are so commonly understood to be essential. If we want our high school students to do more academic work, let's try to figure out how to stop boring and ignoring them in our classes. Let's give them better reasons not to be "absent from class." We've received news that the 14th annual Eisenhower Academy, a summer institute for teachers, will be held July 10 - 15, 2011 at Gettysburg College and Eisenhower National Historic Site in Gettysburg, PA. Sponsored by the National Park Service, Gettysburg College, and Mount St. Mary's University, the Academy presents an in-depth perspective of Dwight D. Eisenhower as president and world leader, and introduces effective strategies for teaching the Cold War era in the classroom. Lectures and discussion cover civil rights, the Cold War, 1950's economics, popular culture, and new scholarship on the Eisenhower Presidency. Field trips include a visit to the Eisenhower's home and a guided walk through historic downtown Gettysburg to explore Eisenhower’s life and times. 717-338-9114 Ext. 4411 (phone); john_joyce@nps.gov (e-mail); or www.nps.gov/eise (web). It is a critical time for us to act to save the Teaching American History Grant program. The 2012 federal budget is still in a state of flux. By May 20th, House members must have submitted to their chairman and the ranking members on the subcommittee that writes the education budget a list of programs that they want funded for 2012. Those leaders are Rep. DeLauro--Dem from 3rd district of Connecticut and Rep Rehberg--Repub. at large from Montana. This is a critical moment as we must approach ALL House members to get them to advise their respective leadership -Rep. Rehberg and Rep. DeLauro- that TAH needs to be funded at least to the 2011 level of $47 million. The entire program is vulnerable again to elimination. A strong message to the House leadership about the program is critical. 1) The Teaching American History grant program is the only federally funded program (NOT AN EARMARK) to provide professional development for history educators. 2) TAH has had an economic impact in every state (please contact me if you need specifics about your state from a dollar perspective). That translates into jobs and local revenues where grants are funded and programs occur. We recommend that you make your appeal personal. Convey in your email or to the staffer about why this program is important to you, to teachers of history, and so forth. The deadline is May 20th for all the legislators to report back to their respective budget leaders about programs they care about. Lets make sure they care about keeping TAH alive and funded! The National Council for History Education has issued a Call for Proposals for the 2012 Annual Conference. The deadline for submitting a proposal is September 26, 2011. Hawaii history teachers, historians and others are strongly urged to submit proposal ideas. Because history is narrative and story, not simply a string of facts, the best works in our field are part of a proud literary tradition. From the accounts of the Ancient Greeks and Hebrews to those written by scholars of the American Revolution and World War II, the appeal of history lies in the power of the storyteller to capture our imagination and carry us back to another moment in time. The worlds they reconstruct are inhabited by heroes and villains, women and men of great wisdom and great foolishness, brilliant leaders and fatally flawed ones—and ordinary men and women whose experiences enrich our understanding of the past. The past is read through art and fiction as well as through the work of historians. From Longfellow and Washington Irving to Charles Dickens and Harriet Beecher Stowe, to Leo Tolstoy and Jane Austin, to E.L. Doctorow and Margaret Atwood , novelists and poets have drawn their inspiration from history, creating a literature that also ‘reads the past.’ And artists from the cave painters to Michelangelo, to Louis David and Charles Wilson Peale, to Goya and Picasso have captured and interpreted critical events and key figures in history. Even in dance choreography like Alvin Ailey’s “Revelations,” history has been the stuff that art is made of. Who, then, should read the past? Is literacy in history critical for every citizen? Can the argument be made that no generation can secure its future without first knowing its past? Does reading the past help develop the analytic skills, critical judgment, and empathy, needed in our modern, complex world—and if so, how best can these goals be pursued? Questions such as these arise from the conference theme for 2012 and wait to be answered. The NCHE invites proposals for presentations and poster sessions on this conference theme, but we welcome as well proposals on any other topic of broad interest to teachers. All proposals will be evaluated on the basis of their intellectual content – that is, whether they are historically accurate and ask interesting questions appropriate to historical inquiry – as well as their ability to engage the audience and their overall contribution to the teaching of history. Attention Hawaii history and civic educators! Have you heard of iCivics? iCivics (formerly Our Courts) is a web-based education project designed to teach students civics and inspire them to be active participants in our democracy. iCivics is the vision of Justice Sandra Day O'Connor, who is concerned that students are not getting the information and tools they need for civic participation, and that civics teachers need better materials and support. Go here for a special section for teachers. Fewer than half of American eighth graders knew the purpose of the Bill of Rights on the most recent national civics examination, and only one in 10 demonstrated acceptable knowledge of the checks and balances among the legislative, executive and judicial branches, according to test results released on Wednesday. At the same time, three-quarters of high school seniors who took the test, the National Assessment of Educational Progress, were unable to demonstrate skills like identifying the effect of United States foreign policy on other nations or naming a power granted to Congress by the Constitution. Go to this link for the full text of the article. Former U.S. Supreme Court Justice Sandra Day O'Connor has released a statement. Go to this link at the National Assessment Governing Board's web site. You are invited you to participate in a upcoming Summer Institute for K-12 Professionals being held in Montréal and Québec City, June 26-July 1, 2011. The program “Québec Dimensions: Historical, Geographic and Cultural Explorations” will offer a unique professional development opportunity. "We welcome the participation of K-12 teachers, curriculum coordinators and administrators with teaching background in social studies, geography, history and/or French." This professional development opportunity organized by the Northeast National Resource Center on Canada will begin and end in Montreal (3 nights) with travel to Quebec City (2 nights). Content is designed for educators who teach Canadian topics relevant to World History, North American Geography, and Comparative Cultures. Quebec, the birthplace of New France in North America, is Canada’s largest province and the only province with French as the sole official language. "We invite you to explore and learn by participating in this program which provides a foundation in history and geography, plus offers contemporary cultural insights through first-hand experience. The Institute content aligns with national social studies and geography standards." -Apply knowledge gained to a collaborative unit which meets state and national standards. Rolling applications are accepted on a first come, first served basis with limited placement available through Monday, May 16. Registration is USD $649 and includes double-occupancy at four-star hotels, some meals, transportation during the program, speaker/educational site fees, and curriculum materials. Additional details are available in the attachment. Punahou School will be hosting two professional development opportunities for practicing educators this summer. Online registration is available now. The Brain Symposium, which focuses on learning and the brain, convenes June 13 – 14, 2011, featuring renowned neuroscientist-author David Eagleman. The fee is $75. The Lab School @ Punahou, a two-week program on the uses of technology in the classroom, runs July 5 – 15, 2011. The fee is $50 for the Lab School @ Punahou. Online registration is available May 6 – 27, 2011. For more information, call 808.944.5737 or email summerschool@punahou.edu. History Education Hawaii, Inc., is very pleased to report that our newly-designed web site is now live. We extend our thanks to Heather Wimberly of Green Rose Design, based in Manoa Valley on the island of Oahu. We are still adding new features to the site, including news of upcoming programs for Hawaii's history education learning community. Stay tuned! We think you'll agree that the best is yet to come! We've received news from the National Council for History Education (NCHE) that the Idaho Council for History Education is presenting a conference this autumn. 'Main Currents of the 20th Century' is scheduled for October 6-7, 2011 at historic Boise High School in Idaho. Proposals are due by May 27, 2011. All proposals will be sent notification of status by June 6, 2011. Email Russ Heller with questions or requests for extensions at russ.heller@boiseschools.org. Invited keynote and plenary session speakers include Paul Boyer, Jennifer Burns, Cathy Gorn, James W. Loewen, Fredrik Logevall, Lisa McGirr, Thomas Alan Schwartz, Sam Wineburg, Shelton Woods, and Pulitzer Prize-winner Jack Rakove. In addition to a dedicated TAH strand, our program will include topics and sessions on United States history, world history, Idaho/regional history, politics, law, economics, geography, and effective teaching strategies in history and the social sciences. This Call for Proposals is directed to those who wish to present content and successful instructional strategies in history and the social sciences. Conference planners especially welcome TAH project presentations and session topics that address developments, events, individuals, decisions, or consequences that bear significant relationship to the conference theme. Proposals may include lectures, panels, roundtables, or workshops. Each proposal will be judged on its merits and contribution to a balanced program. Conference planners offer the following theme-related topics as illustrative only: Modernism; modern art and architecture; Postmodernism; the Great War; mass mobilization, mass consumerism, and marketing; World War II; mass politics and culture/counterculture; totalitarianism and other "isms"; the Jazz Age; the Cold War; the Great Depression; the American Century; Civil Rights; Progressivism; liberalism and conservatism in the 20th century; competing economic systems and theories; constitutional benchmarks; the Holocaust; the three-world order; the rise and collapse of the Soviet Union; European Union; anti-colonialism and decolonization; making a Chinese nation; questions of race; lives of women; international cartels; the nuclear age; the space race; migrations; transportation revolutions; the Information Age; globalization; remapping the Middle East, Southeast Asia, Africa, and Eastern Europe; key figures/biographical sketches in the 20th century; nationalism, politics and economics in Latin America; and bridging the 19th - 20th and 20th - 21st centuries. ICHE encourages presentations on: the use of archives, artifacts, literature, and other arts to inform historical study; local/regional history; academic applications of technology; instruction in document/source analysis; and instruction that demonstrates the integrative nature of historical studies. A-V equipment needs (in detail) Presenters should provide their own laptops, or bring flash drives with needed material (Apple users must bring their own laptops). ICHE can assist with LCD projectors, screens, and other equipment, provided we have timely notice. Internet access in breakout sessions is by ethernet cable only; presenters in the auditorium will have wireless access. Schedule preference (e.g., Thursday am, Friday pm, requests for two time blocks, etc.). Planners will do their best to accommodate requests but cannot guarantee specific placements on our conference schedule. Speakers should be prepared to distribute copies of their remarks/lessons to conference attendees. Electronic copies should be made available to ICHE. Individual teachers, panels and collaborative teams of teachers, Teaching American History grant (TAH) project directors, National Council for History Education state councils, historians, and social science professionals are encouraged to submit proposals. Presenters intending to promote commercial materials, including textbooks and supplemental resources, must indicate this in the proposal. The Conference Planning Committee especially invites session proposals that deal with history instruction in elementary and secondary schools and sessions that address district, state, or national history/social sciences standards. All presenters must pre-register for the conference. Email proposals to linda.barker@boiseschools.org (Word attachments preferred) or fax proposals to Attention: Linda Barker (208) 854-4012. Proposals are due May 27, 2011. All proposals will be sent notification of status by June 6, 2011. Did you know this is Teacher Appreciation Week? May 1-7 has been designated as such. Please show your appreciation to teachers. Go to this link for some resources.